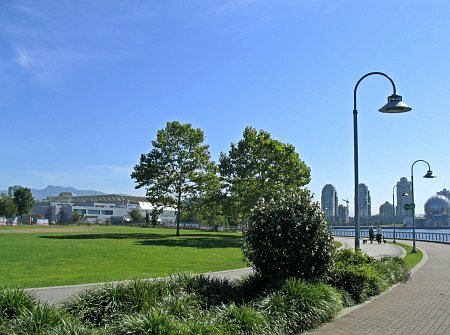 Bordering False Creek, the winding paths and numerous benches of Coopers’ Park are all excellent places to enjoy the expansive views. 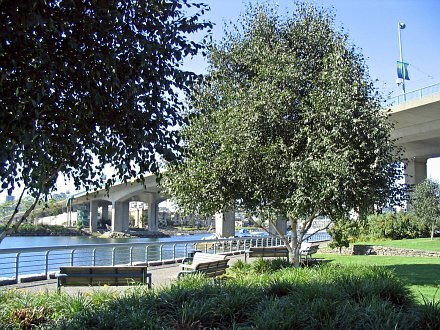 The site of Sweeney Cooperage and Sawmill until 1981, the site now contains a playground and skate park (added in 2003) tucked under the Cambie Street Bridge, as well as plenty of open lawn and colourful plantings. This park was officially opened on October 25, 1997. The site was once home to the Sweeney Cooperage, the largest barrel manufacturer in the British Empire from 1889 until 1980. Barrels made here travelled all over the world carrying goods such as strawberries and other soft fruits in diminutive one quart sizes up to traditional larger (800 lb) casks for whiskey, beer and salt-cured salmon. 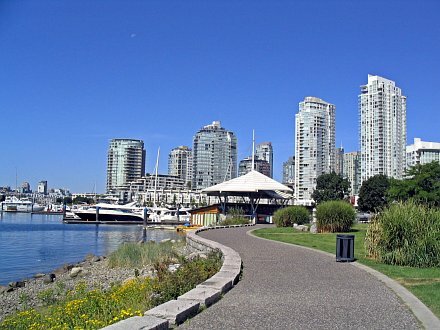 The sawmill which produced the wooden barrel parts was built in 1945 and overlooked False Creek at this location. The cooperage closed in 1981 to make way for the construction of B.C. Place and the new Cambie Street Bridge.